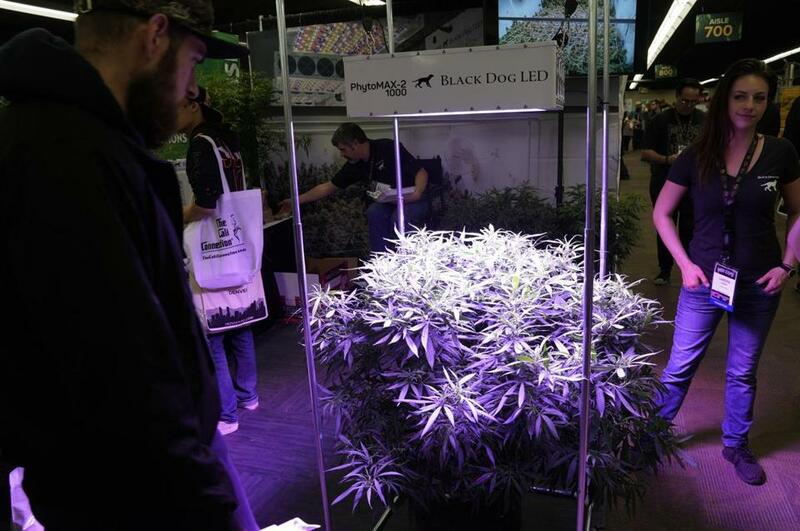 A showgoer looks at a marijuana plant under a Blackdog LED grow light at the INDO EXPO cannabis trade show on Jan. 27 in Denver, Colorado. Marijuana Moment is a wire service assembled by Tom Angell, a marijuana legalization activist and journalist covering marijuana reform nationwide. The views expressed by Angell or Marijuana Moment are neither endorsed by the Globe nor do they reflect the Globe’s views on any subject area. That’s the basic lesson marijuana growers can take from a new study on how lighting in cannabis cultivation impacts yields, the results of which seem to challenge common industry conventions. While many indoor growers give their plants around 300 to 750 micromoles of light per square meter per second (µmol/m²s) using either double-ended, high-pressure sodium (HPS) or specialized horticulture LED lights, the researchers found that a simpler and more cost effective lighting setup can result in even greater harvests. Cannabis crops continue to grow in a linear fashion as lighting is intensified at least up to 1,500 µmol/m²s. And that’s achievable by using high intensity, broad-spectrum (white) lights that cost a fraction of what growers spend on those designed specifically for horticulture. For their experiment, the team, which involved personnel from the Greenseal Cannabis Company, grew hundreds of plants and kept all other conditions, like temperature and soil composition, constant. But the crops were exposed to different types of light and light intensity. They discovered that for every additional µmol/m²s that reached the plant, the yield increased by .41 grams. So when a plant was exposed to an HPS light that delivered an intensity of about 500 µmol/m²s, the total harvest was just under 300 grams. But plants that got 1,500 µmol/m²s from a general purpose LED light produced up to nearly 800 grams. “The results show that holding all else constant, cannabis yields are primarily driven by the intensity of the lighting, whereas there is little evidence that tuned-spectrum lights have a significant increase in yield versus general-purpose, broad-spectrum lights,” the researchers wrote in the paper, which has not been peer-reviewed or published by a journal. Of course, the findings raise reasonable questions about the extra costs for electricity to produce such a strong intensity of light. But assuming that .41 grams has a retail value of $2.32 — and electricity costs $0.11 per kilowatt hour — the greater harvest more than pays for itself. “The additional watts required to produce an additional [$2.32] of cannabis would cost about [$0.04].” (These figures have been converted from Canadian dollars to US dollars). Read this story on Marijuana Moment.